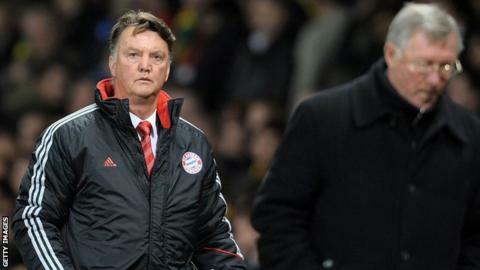 Manchester United have played down a report that Louis van Gaal has agreed to become the club's new manager. The Netherlands coach, 62, has been the bookmakers' favourite to replace David Moyes since his sacking on Tuesday. Dutch newspaper De Telegraaf reported he has signed a deal with United but the club have denied the claim. "There is nothing to report," a spokesman said. "We have not signed a new manager. When we have something to report, we will announce it." Van Gaal is under contract with the Dutch national team until the end of the World Cup finals in Brazil and has previously been linked with a summer move to Tottenham. However, De Telegraaf suggests that he has been negotiating with a United delegation this week in Portugal. Reporter Marcel van der Kraan told BBC Radio 5 live: "Very good sources last night informed us they [Manchester United] have agreed a deal. "Van Gaal flew out to Portugal at the beginning of this week and he is due back this weekend because we have the last week of the Dutch league. "He needed to sort his future out with Manchester United and Tottenham Hotspur because the Dutch national team are soon starting to prepare for the World Cup and Van Gaal didn't want to be bothered on his future. "There was a huge offer from Tottenham on the table and it was either going to be that one or Manchester United. "Our sources, more than one, informed us last night it was Manchester United." In the interim, Ryan Giggs has taken charge of United. The Welshman has been given control for the final four matches of the Premier League campaign, beginning with Saturday's 4-0 win at home to Norwich, but is not expected to be appointed on a permanent basis. "I've got a chance to show what I can do," said the 40-year-old. "My focus is the next four games - not five years down the line. Former Arsenal defender and Premier League winner Martin Keown believes United would be right to go for an experienced coach. "I think [Giggs] is one for the future, but right now they need a safe pair of hands, a proven winner," Keown told Football Focus. "I feel they need that type of pedigree, somebody who has won championships and understands how to work with top players and get the very best out of them. "With Moyes, I know there is a generation of players coming to their end, but they should not have fallen as far as they have done. "There seem to be relationship problems in the team that need to be addressed and a top manager can do that." Van Gaal is a multiple championship winner across Europe but BBC Sport's Alan Hansen believes the Old Trafford post will still be a challenge. "Whoever gets the job, it will not be easy," Hansen told Football Focus. "United are a massive club but they need new players. Do you give somebody £150m, and say buy a whole new back four? Well it's a lot harder than it sounds." What is the Manchester United way? Read more on What is the Manchester United way? An explanation.